That is interesting. I guess I'd never even really thought about whether a stream was down there, though I had guessed that there was some kind of wetlands at least since it's obvious they didn't build on it because it was lower ground. Also, it seems that on both google and bing aerial views, that they are taking during the time of year when there is too much tree cover to really make out the course. Though, Google does render in the course in its regular street map. Cool. So, I went to the city zoning map imagery, and it's taken during the fall where you can clearly make out the course. In this view, you can see that the tracks and associated infrastructure was removed long ago. There is no bridge over the creek any longer. And, to place it more exactly, the bridge looks like it'd be directly north/behind the playfield for the Lansing Charter Academy on Express Court. BTW, Reid Machinery, whose main facility is on a seperate lot off MLK - appears to own all of the old rail right-of-way down to Mt. Hope and Pleasant Grove. There are two seperate owners of the open space on the western end of the creek and associated wetlands. Lansing Parks & Rec owns a 5.3 acre at the end of Holly Way, and it's designated "Holly Park," though it's not a developed park and I'm not even sure if it's listed in the city's inventory. A coupled based in Delta Township owns the nearly 16 acres at the western end of the creek, which has two outlets onto Pleasant Grove. What I found interesting is that this land was sold to them just this past October for a dollar to what must have been an LLC they just created. Makes you wonder if they plan to develop or market it? More than that, I'm curious if the creek was ever named? Wow, great info. Thanks for digging in! BTW, some more history on this, as I had researched the rail line a few years back is that it was originally part of the LS&MS (Lake Shore & Michigan Southern) Lansing Division Jonesville to Lansing, which later bought out by Michigan Central/New York Central Railroad. This line was most famous, of course, for servicing the the REO Town Plant, and all that infrastructure is still there north of MLK. I'd post the old Sanborn maps of this area if the library still had a subscription. What I've seen on the internet is any case is that the line north of Litchfield, Michigan (just north of Jonesville) was taken out during the Great Depression, so it's been gone for quite some time. MichMatters. The Library of Congress digitized the Sanborn Maps awhile back. Thanks, though the Lansing library subscription had them arranged in a much more user-friendly way. A first blush, it looks like the maps I'm looking at (1913, republished in 1953) cuts off literally just at this area since it hadn't been developed yet. I'd always thought this area had been annexed sooner, but this shows it was among the last areas to be annexed. 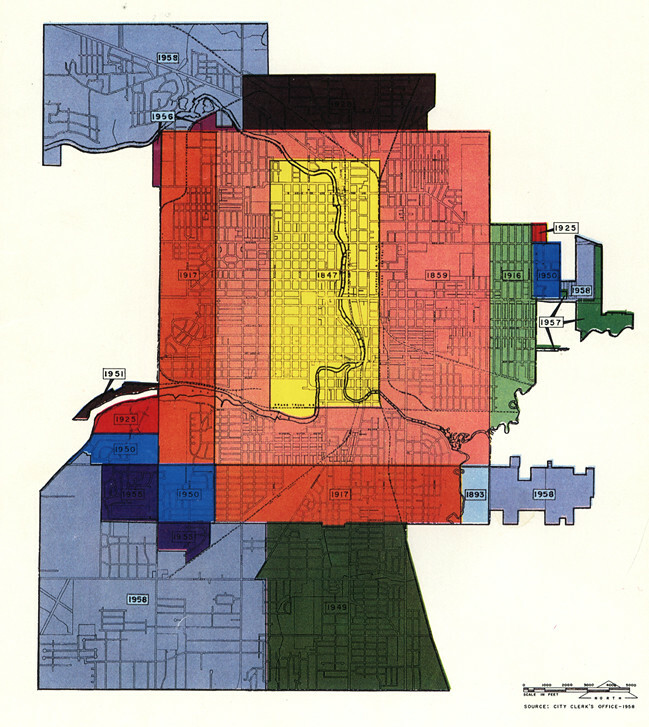 Only a few other larger areas on the southside were annexed in the 60's. Is that an old airfield in the southwest corner (1958) ?? Very interesting little concept that didn't last long. These are the woods that boys in my neighborhood would "run away" to and also it was a spot for teenage partying and hobo camps. It was considered a dangerous place with trains still running through there. It was known by Schafer's Woods or Lindell's Woods. This area was and still is middle-class homes like in Church Hill Downs[where the airfield was], but the retail and schools have changed and I think poorly serve this neighborhood today. This could be a part of Lansing with a real neighboorhood elementary school where local kids go to school all together through the grades creating a community around the school. It is one of the most distant from downtown and as I have noted before could be a town four corners with a mini-city hall/police station, the school, a bank branch and the like so that folks who live right there would do business all in their own neighborhood. @sabatoa Thanks for those aerials. It's interesting to see the area right as it was beginning to fill in.